Even if your reason for going into the wilderness to disconnect, it's not a bad idea to bring a smartphone with you. 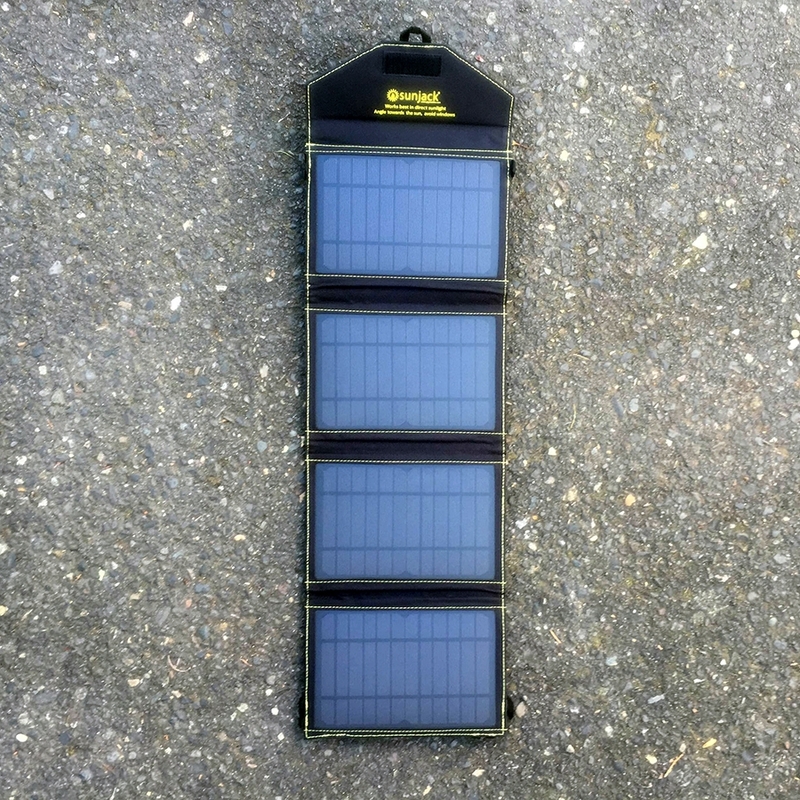 Navigation, geocaching, plant/bird identification, and making emergency calls can drain a battery in a hurry, so if you've been considering a compact solar charger with a battery to top off your electronics on the trail, check out the SunJack 14W+8000mAh Battery. The SunJack 14W+800mAh Battery is a rugged solar and battery solution that is perfect for campers, hikers, vacationers, RVers -- anyone. It's also a nice addition to an emergency kit if you live in a storm-prone area. 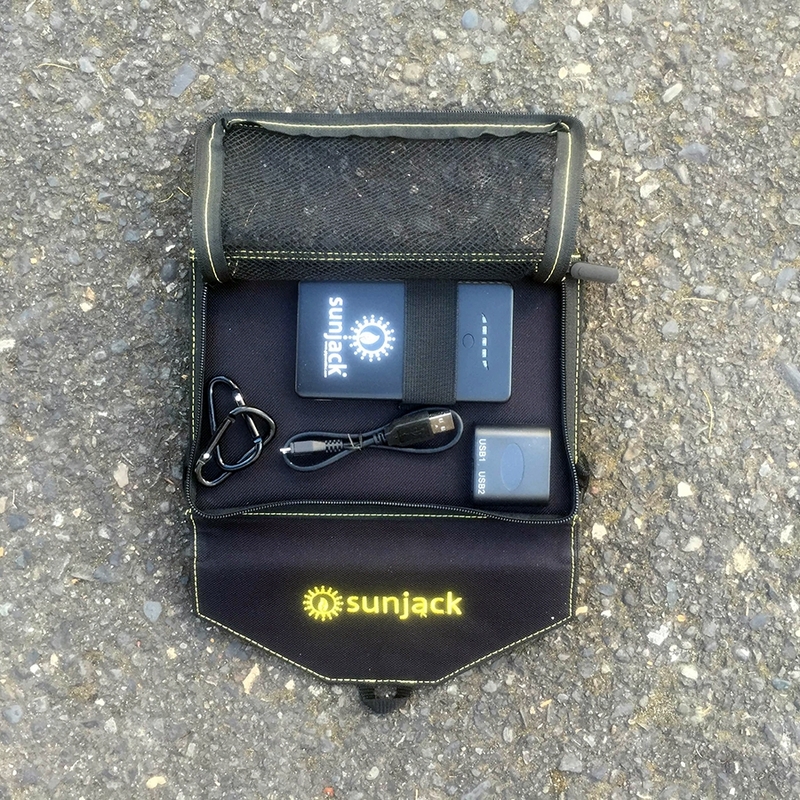 The SunJack has 4 solar panels, which fold out from the durable case. It's super easy to set up. Just flip, flip, flip, and it's ready to charge. A mesh pocket on the back of the panels keeps the charger, battery, USB battery charging cable and 2 caribeners nice and tidy. Although the SunJack's battery comes fully charged, when it's time to give it a boost, find some good, direct sunlight. Avoid "shading" (covering any of the panels' cells with shadows), as this drastically reduces the energy production for the entire panel. Set it down flat with the panels facing upwards, or tilt it at an angle. It can catch rays through a window or a windshield, but this will also limit energy production. When the battery is connected to the charger, and the charger is charging, blue lights will appear on the battery. Each battery corresponds to 25% of the battery's capacity, so when all 4 LEDs are illuminated, the battery is fully charged. Right on! Now it's time to power your electronics with sun juice! 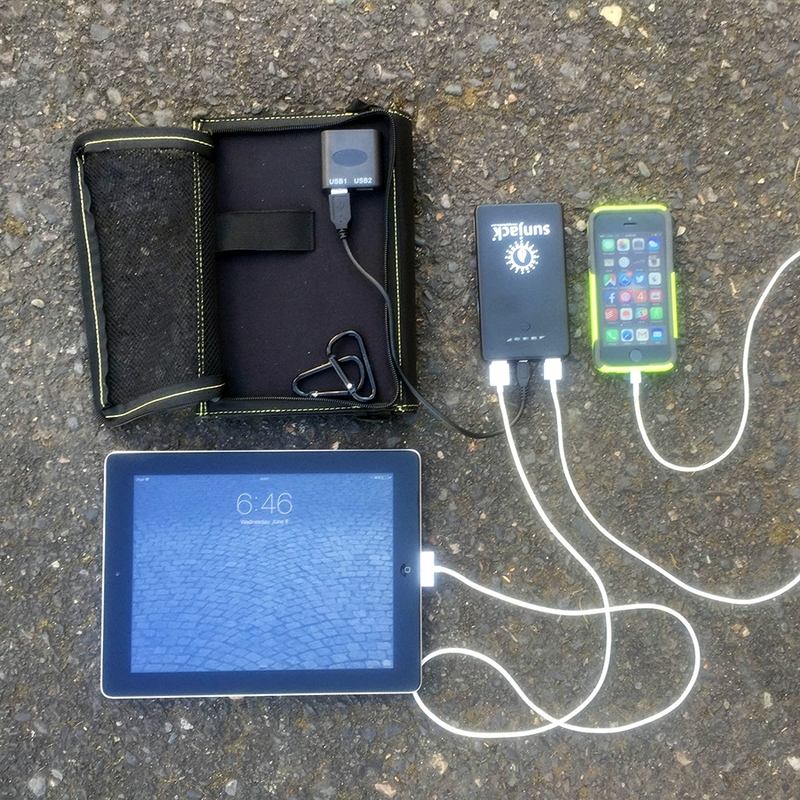 You can charge up to 4 electronics at time directly from the SunJack charger and battery. There are 2 USB outputs on the charger and 2 additional USB outputs on the battery. It takes 5 hours of direct sunlight to charge the battery fully. 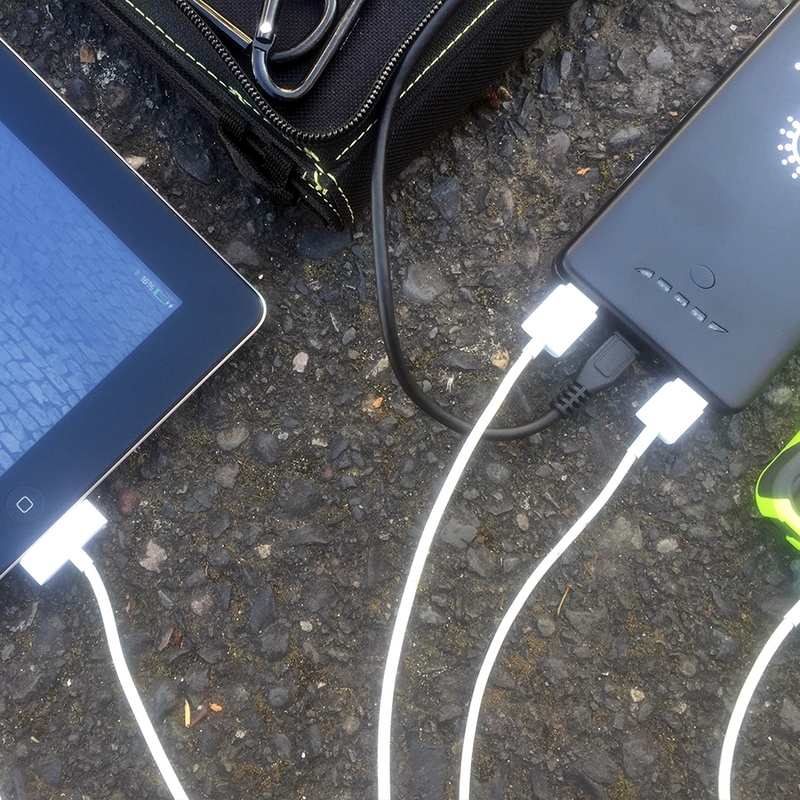 According to SunJack, the battery is able to charge 1 tablet or 4 smartphones on one charge. The time to charge up a smartphone is 90 minutes (that's about the same amount of time as it would take from a wall outlet!). But wait: there's more! I love the extra little feature of a built-in flashlight on the battery. Simply press and hold the power button, and the low-power LED beam comes to life. I took the SunJack camping to test it out. After getting my iPhone down to 9% battery life, I plugged it in to a fully-charged SunJack and started the stopwatch. In 95 minutes, the phone was back up to 100% battery life. 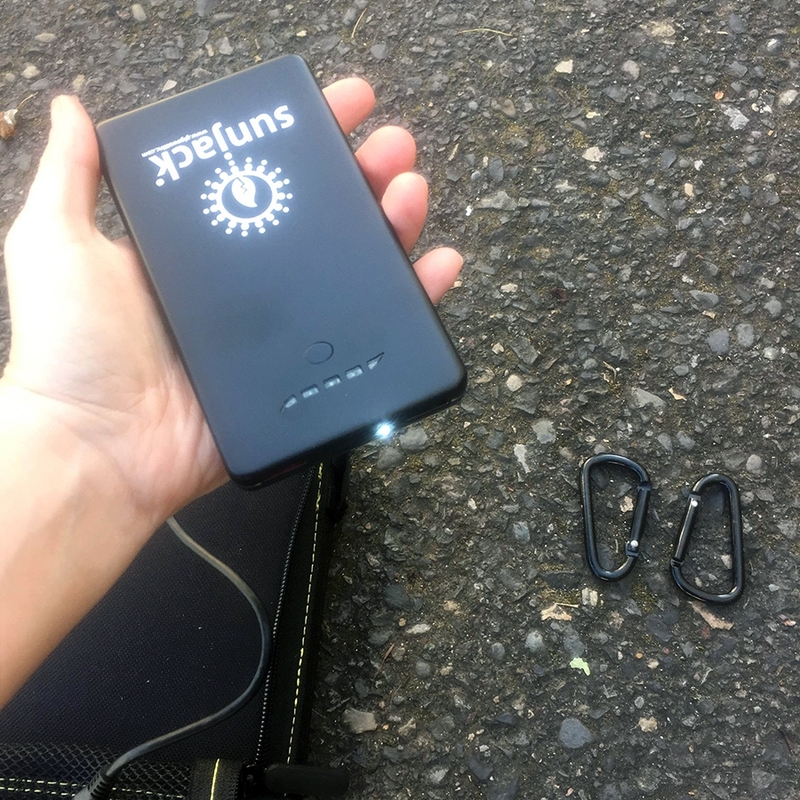 The SunJack's battery pack, which was not receiving any sun during the charging process, showed 2 out of 4 LEDs by the end. I recharged the battery using the solar panels, a process that took a couple of hours, as it was already at 50%. Then I plugged in my tablet. It made it from 2% up to 40% before I maxed out the battery. There are 4 high-efficiency monocrystalline solar panels, providing 14 watts. 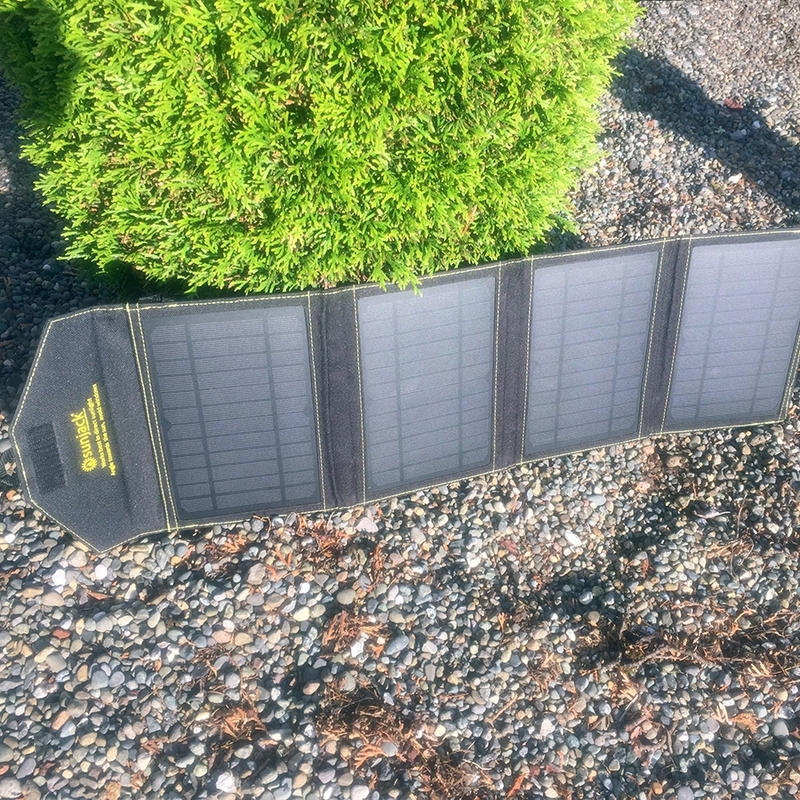 The monocrystalline solar charger is 7 watts. The battery is a 8,000mAh lithium-polymer. The maximum voltage/current is 5V/1.5A via one USB port. Folded up, the SunJack is about the size of a tablet (9" x 6.5" x 1.75"), and unfolded, it's 9" x 31" x 1". It weighs 1.75 lbs. With a one-year manufacturer warranty, and arriving on your doorstep fully charged, the SunJack is ready to hit the trail the moment you get it. As of July, 2016, it sells for $150. Weight: If you're a minimalist who's concerned about weight, be aware this kit is 1.75 lbs. You can shed some of the weight by leaving the battery at home, but then you lose a lot of the flexibility, as you have to charge you're device while the sun's out (which is when you're most likely to be out hiking). Different Phones, Different Specs: Based on my smartphone and tablet charging tests, I found that it's possible to charge 2-3 iPhones up to 100% or 1 tablet about 40% on one battery charge. Depending on the battery size/energy consumption of your device, your mileage may also vary from the 4 smartphones or 1 tablet the SunJack website indicates the battery can charge. Bottom Line: The SunJack 14W+8000mAh Battery is a solid solar kit. It's well-suited for rugged environments and performed great in the field. It has a streamlined, easy-to-understand setup, and it has everything you need to gain energy independence anywhere. Impressively, it's possible to get a full battery charge from the solar charger even on a short or cloudy day. Be aware the battery capacity might be overstated when it comes to your device, but if you're going into it with eyes open, we definitely recommend it! 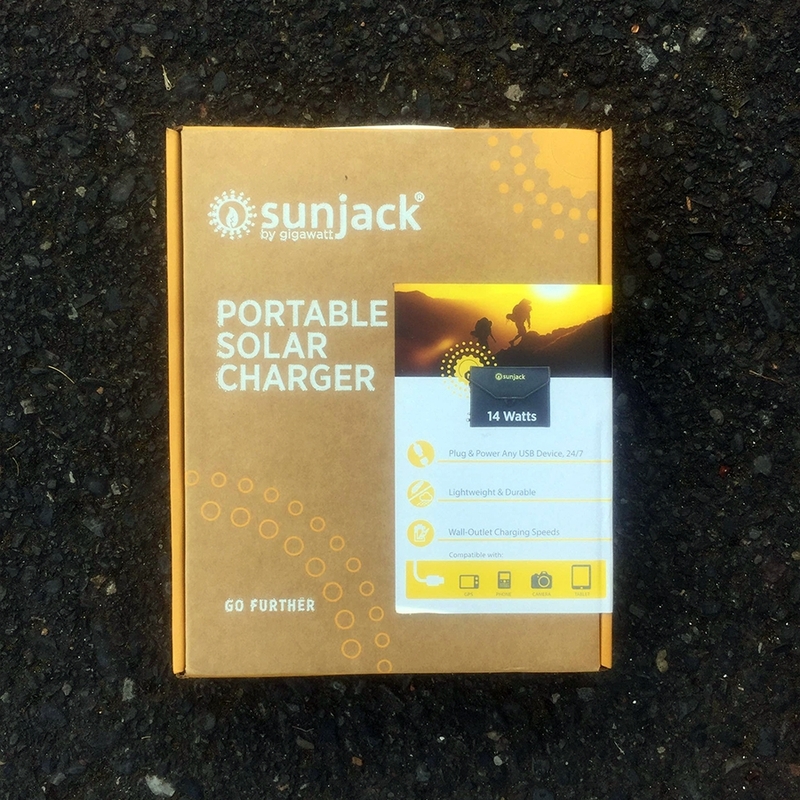 Have you used a solar kit like SunJack's? How has it given you more freedom on your adventures? 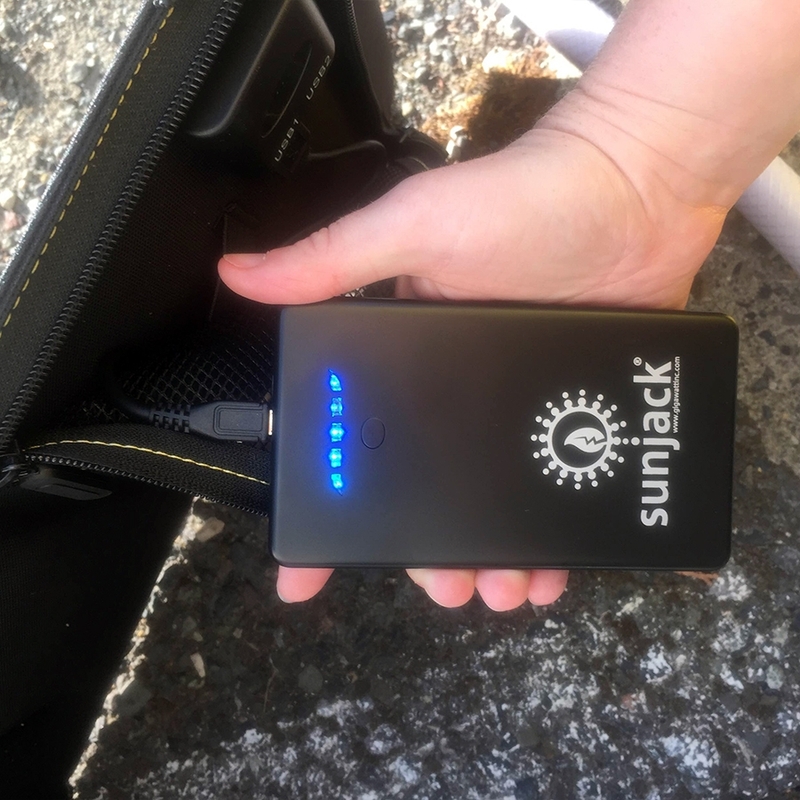 Disclosure of Material Connection: We received the SunJack 14W+8000mAh Battery for free from Sunjack as coordinated by Outdoor PR in consideration for review publication. Our opinion is 100% our own.